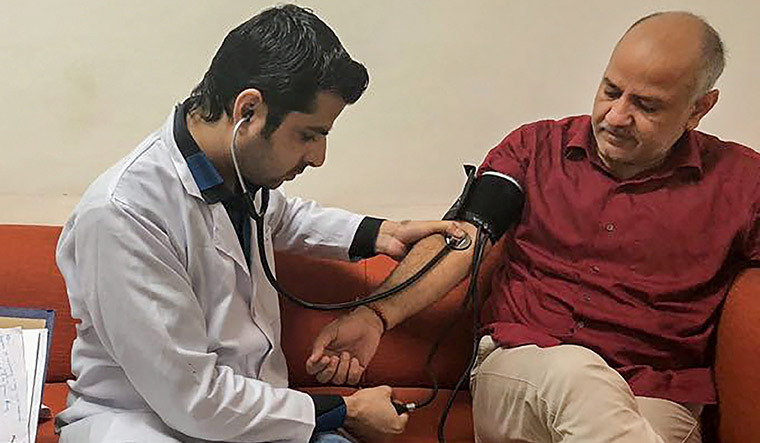 Deputy Chief Minister of Delhi, Manish Sisodia, was on a week-long hunger strike, along with Chief Minister Arvind Kejriwal, at the office of the Delhi lieutenant governor, demanding that IAS officers return to work. Subsequently, he was admitted to Lok Nayak Hospital, Delhi, owing to his bad health. Now recovered, Sisodia has resumed work. He said his government, too, is “super functional”. But, he added that the Narendra Modi government will continue to think of ways to destroy it. Manish Sisodia was a journalist and social activist before entering active politics. He became deputy chief minister of Delhi in February 2015. Along with Arvind Kejriwal, he founded an NGO—Public Cause Research Foundation—in 2006, and campaigned for transparent and participatory governance. He was was an active participant of the anti-corruption movement in 2011. When the Aam Aadmi Party was formed in 2012, he became a member of its political affairs committee. He is currently a member of the national executive committee of AAP. There is a criticism that Arvind Kejriwal has returned to his old dharna politics. How do you respond to that? What options does a common man have for peaceful protest? You can no longer call yourself a common man. No, but what options do we have to make our point, except to agitate in a peaceful manner. We cannot pick up guns or become violent. Satyagraha is our only instrument to make our point. And, in any case this situation developed very spontaneously. We—the chief minister, I and two ministers—went to meet the lieutenant governor, and asked for time. He declined to give us time immediately. We thought if we sit in the waiting room, sooner or later he will call us in. So, we kept waiting. But, can you believe that for nine days he did not say a word to us. I thought, at least on Eid he may come, and hug and wish us—even if he did not want to discuss politics. But, even that did not happen. Where Raj Bhavan is today, is where the British Viceroy once sat. But, even he met freedom fighters. Why could not the lieutenant governor meet us? Your protest got support from Kerala Chief Minister Pinarayi Vijayan and Bengal Chief Minister Mamata Banerjee. But, wasn’t it unfair to complain that they were not allowed to meet you at your dharna? You were not in your own house or office. Let me make it clear—the lieutenant governor’s [house] premises are not his private property. They belong to the people, to the taxpayers. So, you cannot make the argument that we were trespassing on anyone’s private space. You have reached a working compromise with the IAS officers at the moment. But, do you not think it was a failure of the Aam Aadmi Party that it could not win the trust of bureaucrats? Let me first say that 90 per cent of bureaucrats are excellent and have cooperated with us on everything. But, every IAS officer who was doing good work was either threatened or warned by the Centre, or transferred out. I cannot name them, but officers have told me in confidence that they are being mocked for working with us. But, most of them are still excellent at their work. How else could we have improved the quality of the government schools if the IAS [officers] were not doing their bit? But, there is an ongoing case in which the Chief Secretary of Delhi, Anshu Prakash, has accused two of your legislators of assaulting him. Why haven’t you addressed this issue in your appeals to the IAS association? Whatever you may think of us, do you really think that Arvind and I would order the assault of a senior IAS officer? You may not order it. But, the MLAs who were present allegedly manhandled the chief secretary, and he has filed a formal criminal case of assault. I was also present that night. And, I am saying the charge is absolute rubbish. No one slapped or hit the chief secretary. We reject this allegation. Now, the one party that did not support you is the Congress. How do you see their position? The Congress may have their problems with us. But, they should pause and reflect. Tomorrow, the Narendra Modi government could take control of the IAS machinery in one of the states governed by them. What will they do then? They do not have to worry about us. But, they should worry for themselves. The Congress alleges that the AAP was born from an anti-corruption movement that was supported by the RSS and the BJP. They repeatedly quote a statement by Arvind Kejriwal where he said that he will campaign for the BJP if it brings full statehood to Delhi. You have said this is a rhetorical comment. However, this insinuation continues, of your party being soft on Modi and the BJP. This is ridiculous. Please remember that it was Arvind Kejriwal, and not Rahul Gandhi, who took on Modi in the Varanasi [Lok Sabha constituency] elections in 2014. How can they even suggest such a thing? I do not know if the Congress is scared or has lost its vision. Or, perhaps it has been in power for so long that it has become complacent and just does not care. The Congress points to former Delhi chief minister Sheila Dikshit who ran Delhi without any of these problems for years. They ask if she could, why can’t Arvind Kejriwal? It is important to know that Sheila Dikshit had many more powers than Arvind Kejriwal. The Modi government snatched away our powers in 2015. I hope you know that today the Delhi chief minister does not even have the power to transfer a peon in his office. Even transfers of peons are done by the lieutenant general’s office. That is how bad it is. What gesture will come from you that this temporary truce can be converted into a functional government? We have done a lot of work in three years. We are already functional. In fact we are super functional. Think of our achievements—mohalla clinics, improving government schools and cheap electricity. We just launched a special scheme to make it easier for single mothers to get certificates for their children. As far as permanent solutions go, if IAS officers regularly attend our meetings, there is no holding us back. But, the amount of trust we have in us, we also have in Prime Minister Modi. He has great power to destroy things. Demonetisation destroyed the economy. I expect that his government will continue to think of ways to destroy us.